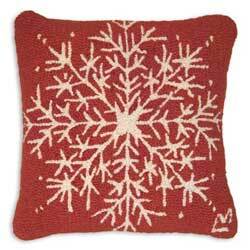 Snowflake Hooked Pillow, by Chandler 4 Corners. Measures 18 x 18 inches. Hooked pillow made with 100% New Zealand wool. A Laura Megroz design. Zippered velveteen backing with poly-fill pillow insert.